The use of alcohol doesn’t always lead to alcohol dependence and researchers still do not know what actually causes it, but, once the person develops it, they risk consequential harm to their psychological and physical health, families, and others in society. Alcohol abuse can be excessive or frequently drinking, binge drinking, or drinking despite any negative consequences. Repeat episodes of alcohol abuse changes the way the brain functions and increases the risk of developing alcoholism, or alcohol dependence, although the person does not have symptoms of withdrawal when they discontinue use. Also known as alcoholism, dependency to alcohol is characterized by tolerance, cravings or compulsions to drink, impaired control over drinking, continued use or abuse of alcohol despite adverse consequences, and a physical dependency that causes withdrawals when alcohol use is discontinued. What Happens When a Person Develops Alcohol Dependence? Alcohol increases dopamine in the brain as a reward response for its consumption. Repeat abuse of alcohol causes depletion of natural dopamine productions and interferes with central nervous system controls of every other part of the body. Until the alcoholic consumes more alcohol, the central nervous system sends and receives a variety of mixed signals that make the person feel physically ill or experience negative psychological effects known as alcohol withdrawal syndrome. 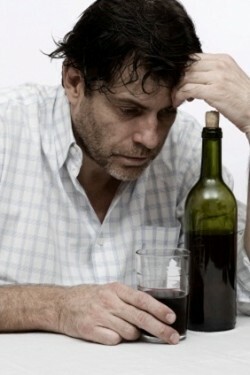 Being dependent on alcohol means that you crave it, and your body reacts when you do not have it. The person needs to continuously drink alcohol to avoid withdrawals, to feel a sense of normalcy, and to balance out the reactions in their brain and central nervous system which have been damaged by the repeat alcohol abuse. Alcohol toxicity damages the liver, kidneys, and other organs, including the brain, and is a third leading cause of preventable deaths in the United States, according to the National Institute on Alcohol Abuse and Alcoholism. Psychological withdrawal symptoms such as hallucinations deliriums, anxiety, depression, suicide ideations, harmful tendencies, etc.